Year One of the WSET Diploma is done and dusted and in keeping with the metaphor I have dusted off my keyboard and returned to something that gives me great pleasure in addition to drinking wine – writing, or rather, rambling about it! At a tasting of South African wines with my tasting group I came across a wine I wanted to know more about – the Rubicon 2008 from Meerlust Wine Estate. Found in the Stellenbosch region of South Africa, Meerlust is named after its location meaning ‘pleasure of the sea’ and in reference to False Bay, only 5 kilometres from the manor house and vineyard. Image credit: Wines of South Africa. A family owned and operated business with origins back to the early days of winemaking in South Africa, the Myburgh family who continue to own this vineyard first took ownership of the estate in 1756 when they purchased it from the original owner Henning Huising. I love the sense of history associated with this winery; Huising established Meerlust Estate in 1693, less than 50 years after the first vines were planted at the Cape of Good Hope in order to provide a refreshment station for those Dutch East India Company employees taking a break in their journey to lands further afield. The cellar at the estate was built in 1776 and although thoroughly modernised for today’s winemaking, all the changes to the cellar have been with the goal of preserving the historic building for generations to come. Cooled by sea breezes and mists rolling in from the coast, vines are able to enjoy a longer growing season and management of South Africa’s heat. 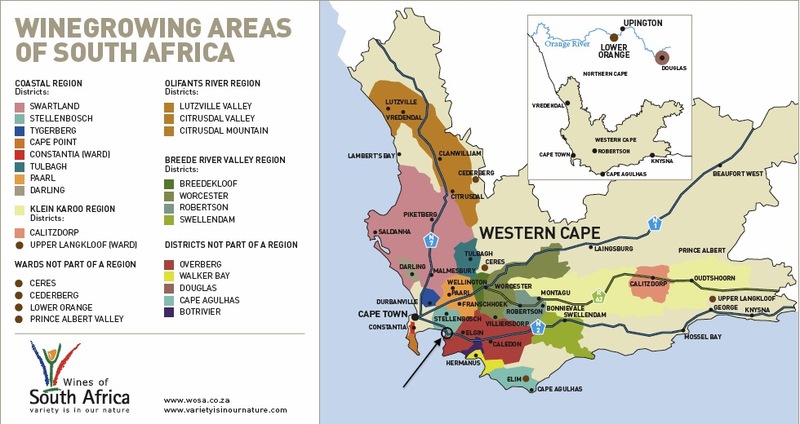 The location is so suited to growing quality vines that in 2003 Meerlust Estate successfully registered as a ‘unit for the production of estate wine’. The term is used on a label to indicate the grapes used to produce the wine have been grown on the estate and the wine has been made and bottled on the estate – it is also seen as a sign of quality. Meerlust Estate produce a number of different wines but it was a trip to Bordeaux that inspired Nico Myburgh and winemaker Giorgio Dalla Cia to experiment with blending different red wine grapes and eventually launch Rubicon in 1980. The blend was then Cabernet Sauvignon (70%), Merlot (20%) and Cabernet Franc (10%). Today the blend remains the same but may also include a dash of Petit Verdot for the colour and spicy aromatics this grape offers and in fact the Rubicon 2008 includes 1% of those thick-skinned deeply coloured Petit Verdot berries. The summer of that year was a cool one allowing the grapes to remain on the vine for longer which, when combined with the location of the winery, translates to a longer, slower ripening period. Each grape variety for the Rubicon wine is hand harvested and fermented separately with fermentation taking place in stainless steel tanks before each of the wines are aged for a period of time in 300L French oak barrels. After the malolactic fermentation has completed the development of each wine is assessed and it is only then that the blend is created. After blending the wine is transferred to oak barrels for a further 18 months of ageing and homogenisation of all the blending components. The oak barrels are a mixture of 70% new French oak and 30% second fill barrels. Following maturation in oak the wine is bottled and left to continue ageing in bottle for another two years before release meaning the wine is always four years of ages when available to the market. This wine is made to continue ageing for many years after release and, according to the website the first release from 1980 continues to drink well after 30 + years in the bottle. For our tasting however the wine was a young pup of a mere six years of age. The concentration and complexity of aromas and flavours of were elegantly framed by texture, acidity and oak. Layers of black fruit, tea leaf, subtle sweet spice and those wonderful first signs of age with tobacco and cigar box were revealed. This wine enjoys a well-deserved international reputation and recognition when one talks of wines from South Africa – no mean feat in the highly competitive world of wine! Looking at the distribution network on their website it should not be too difficult to get your hands on a bottle and if you have not done so – what are you waiting for? This is a wine to be shared with some good friends over a great meal and I would not be surprised if you found it difficult to stop at one glass! 2. Malolactic fermentation: Conversion of stronger malic acid naturally present in new wine into lactic acid (which has lower acidity) and carbon dioxide. Page 422. Robinson, J., ed. (2006). The Oxford Companion to Wine. Great Britain: Oxford University Press. ← Greco di Tufo; still or sparkling? Or … what exactly is that?